Welcome to L SPA DaNang ~ The Leading Massage and Body Therapy Service Provider among DaNang Spas. Our Ongoing Commitment and Motivation are to Service Excellence and Complete Guest Satisfaction. We look forward to serving you! book by KAKAO ~ ID and requirements at bottom of page. We invite you to pause, step away from routine and allow us to relax and rejuvenate you with superior massage service in our comfortable spa atmosphere. services while providing the highest level of body massage available among the many choices of DaNang spas. While there are numerous differences in the quality of services provided by L Spa and other massage providers in DaNang, the primary distinction is in our highly trained, on-staff therapists with a commitment to their craft and motivation to excel with each day and guest served. 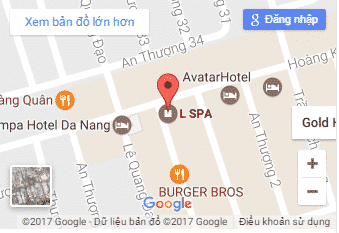 Our personnel, attention to service detail and general management approach set L Spa apart from all others and has allowed us to become the leading spa and massage service provider in DaNang. We look forward to welcoming you and introducing the L SPA Difference. ~ Please call for Same-Day Reservation assistance for bookings after 12:00 p.m.
~ Transportation services are not available. We are pleased to call a taxi following service. ~ Cash Payment Only is accepted. Provide booking name, date and time, number of people and if you are booking for 60 or 90 minutes of massage service and we will respond to inform availability. Note: Requests without the booking details above may not be responded to.